This class is designed for boys and girls who want to concentrate their efforts on the tumbling aspect of gymnastics, so it is great for those who aren't interested in the other Olympic gymnastics events. This class emphasizes the fundamentals of tumbling: cartwheels and round-offs, with an introduction to back-handsprings. This class is designed for the tumbler who has mastered what is being taught at the introduction to tumbling level. At this point, we are ready to put more emphasis on the standing back-handspring, eventually combining the round-off and the back handspring. We are still focusing on the correct technique of the cartwheel and round-off, making the round-off back-handspring easier and safer. This class is designed for the tumbler who has mastered what is being taught at the intermediate tumbling level. At this point, we are putting the round-off and the back handspring together with little assistance and working diligently on the standing back-handspring. 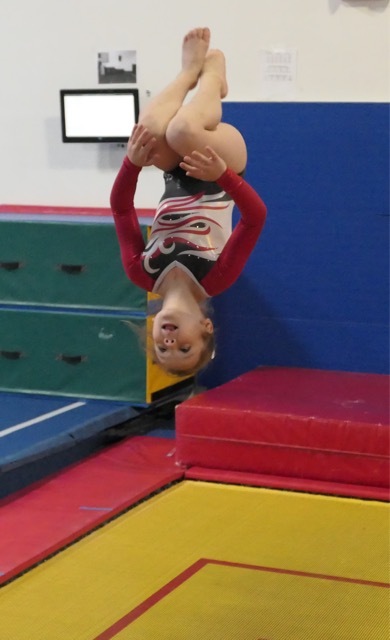 Because the keys to a good round-off back handspring are correct technique and self-confidence, the main focus in the accelerated class is getting in the repetitions to accomplish both.